Schola Nova is the resident instrumental and vocal ensemble of the International Institute for Culture. Founded in the autumn of 2002, the group is committed to the preservation and performance of the great patrimony of Western Music. 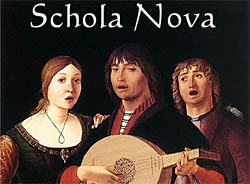 Schola Nova is a chamber ensemble, blending voices and instruments in various combinations to achieve an intimacy modeled on the camerata of the early Italian Baroque. The group focuses on the music of this period, but also relies on the great treasury of Renaissance polyphony as well as works of the modern repertory. Like the Florentine Camerata of three centuries ago, Schola Nova is eager to perform new works which reflect the continuity of the Western musical tradition. Since the Schola does not restrict itself to the music of any one era, the membership of the group expands or contracts according to the demands of the repertoire at hand. Under the leadership of Timothy McDonnell, the ensemble employs some of Philadelphia's finest musical talent. In an exciting inaugural season featuring works of Corelli, Purcell, Monteverdi, Buxtehude, and Pergolesi, Schola Nova has called on the virtuosity of musicians of international repute: cellist James Holesovsky, bass John Alston, soprano Andrea Brown, guitarist Alan Krantz and composer Harold Boatrite.